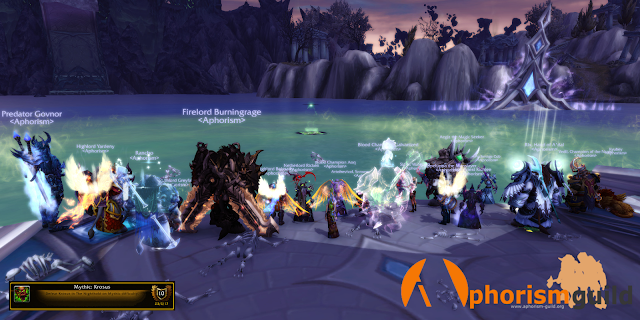 Aphorism: Numbers Mate.. DPS Check Krosus Down! Since Krosus can't leave his 'Yellow' water we did wonder why we bothered fighting Krosus in the Nighthold in the first place.. Should we just leave him to soak in his bath tub.. nah. We're not a guild to shy away from challenges so figured we'd rock up, hit him around a bit, and then loot his corpse (after cleaning said items from the piss-stained water). A really good kill in the end, and a lot of low-wipes leading up to it. A superb guild effort and a kill we're really proud of, everyone played a really important part in our progress if they were on the kill or not.